Shais Taub is a popular scholar and teacher of Jewish mysticism whose contributions to Jewish recovery include authoring the bestselling book, G‑d of Our Understanding: Jewish Spirituality and Recovery from Addiction which was lauded by Jewish recovery pioneer, Rabbi Dr. Abraham J. Twerski. National Public Radio dubbed Rabbi Taub "an expert in Jewish mysticism and the Twelve Steps" for his work with the Jewish recovery community in Milwaukee where he lived for six years. He currently directs Conscious Contact, a program providing meetings for Jewish prayer, meditation and study at the Aleph Institute NE in Pittsburgh where he now lives with his wife and children. He was recently selected to deliver the keynote address "G‑d and Recovery" at the First Annual Conference on the Evolution of Addiction Treatment in Los Angeles, CA. 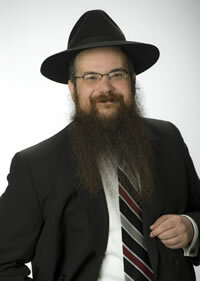 Browse lectures and articles by Rabbi Shais Taub, by clicking here. Your book is a miracle! Beyond the content of the book itself, and your unique perspective on the subjects of addiction and recovery, your book simply has a way of landing in the hands of exactly the person who needs it, when they need it. A rabbi gave it to a friend in recovery without knowing that this friend was an addict, and precisely when he was starting to work step 2 and 3. This friend then bought a bunch of copies and out of the blue gave me one, when I was starting to work step 2 (this fiend and I had just met a few days earlier, by the way). Today, I'm walking into the meeting with your book tucked under my arm, but the title clearly visible. And a person along my way caught a glimpse and stopped me: "what book are you reading?". We had a conversation about it and he mentioned a person he just met, jewish, who just finished detox and is having trouble accepting spirituality in his recovery... And so it continues.... The hand of God creating miracles. I love your column in the Ami Magazine. I am amazed at the clarity of your responses. Is there any way to privately get in touch with you? L Khaym Work as such deserves a Lekhaim ..even if only on grape juice ..
Amy Winehouse Thank you for your thoughtful words. I work with alot of young, immature drinkers and potsmokers who think Amy got what she deserved- joking how this was her "first 24 hours of sobriety". I cannot get through to them. Maybe it is their immaturity.